When visitors to the Mob Museum in downtown Las Vegas experienced cellular connectivity problems in its 80-plus-year-old building, the museum’s technology team contacted BlueCable Networx to devise a unique solution with a WilsonPro passive Distributed Antenna System (DAS). The Mob Museum in downtown Las Vegas is a popular attraction with tourists to Sin City. The museum captures the rich history of desert mobsters like Bugsy Siegel and Frank Costello who played an integral part in early development of Las Vegas casinos. As popular as the Mob Museum has become, early visitors experienced dropped calls and lack of data coverage once inside the 44,000-square-foot building, despite the excellent service in downtown Las Vegas. The Mob Museum building materials caused the lack of a quality cellular signal. 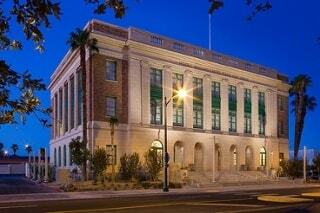 Built in 1933 as the Las Vegas Post Office and Courthouse, the building that currently houses the museum was constructed of notoriously cellular unfriendly materials, including brick, concrete and steel. The Mob Museum’s existing cellular booster system was rendered virtually useless by the problematic building materials. Due to the strong outside signal, the existing booster system wouldn’t activate because it didn’t recognize that the signal needed enhancing. In need of a viable solution, the Mob Museum contacted WilsonPro dealer BlueCable Networx to help them overcome their unique signal challenges and provide a cellular connectivity solution they couldn’t refuse. BlueNetworx used a spectrum analyzer to narrow down the issues with signal strength before designing a cellular coverage solution. With the results, the WilsonPro-dealer designed a split-signal approach with two separate antennas. With one antenna tuned for 700 MHz/800 MHz and the other for 1900 MHz/2100 MHz, the combined system gathered signals from all major carriers, which were then joined together through diplexer. BlueCable technicians found the signals on the 1900/2100 frequencies overloaded the booster, but by using the split approach were able to separate out the strong frequencies. The new system captured signals outside of the building and distributed and boosted them inside, providing complete cellular service for guests of the museum. Watch our video for more on the Mob Museum’s enhanced cellular connectivity solution. WilsonPro passive distributed antenna systems (DAS) provide comprehensive cellular connectivity solutions in even the most unique environments. 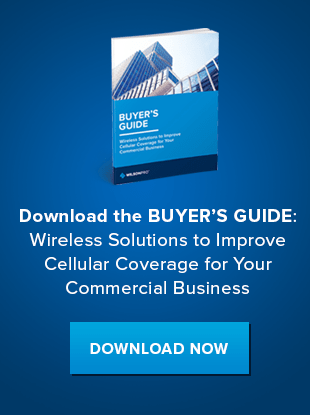 Contact BlueCable Networx, a WilsonPro reseller, to learn more about how a passive DAS can boost cellular connectivity for your business. Or, download our case study to read more about achieving optimal cellular connection in retail locations, despite building materials and geographic challenges.